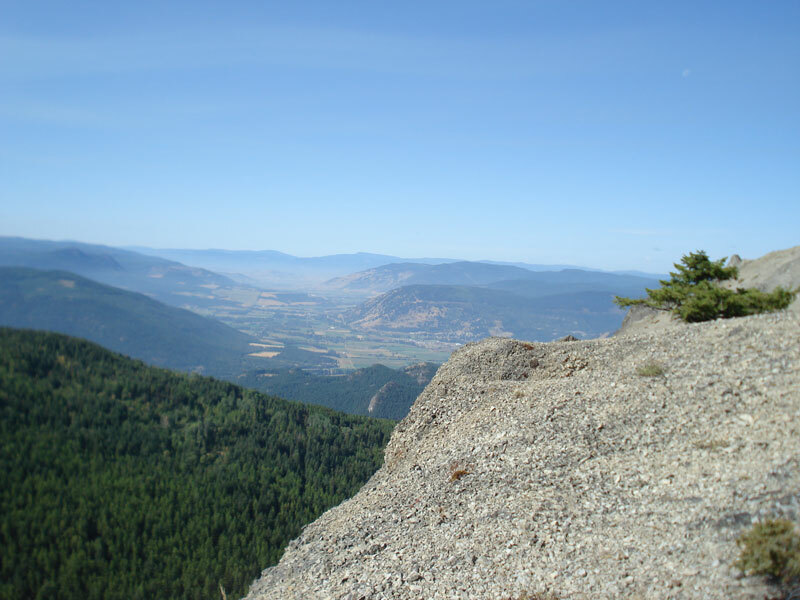 The North Okanagan boasts some of the most spectacular hikes in British Columbia. Walk through old growth forest over moss-covered floors and follow the trails up to alpine meadows surrounded by jagged mountains and stunning glaciers. For every adventure traveller, an all-day backcountry hiking experience during an Okanagan vacation is a must. When venturing into the remote countryside you will find out what Canada is all about; wilderness pure. You think you don’t have much time, hiking is not your thing and the wilderness scares you? You’re travelling with kids and they don’t like hiking, or you don’t have a travel partner. Get out there and do it anyway. Choose one of the easy hikes offered at every tourist destination; you will be ever grateful that you did. The following trails are my favourites in the North Okanagan. They are all easily accessible from Lumby or Cherryville, British Columbia. Stop at the Visitor Centre in Lumby to get directions and a trail map and inquire about trail conditions. Find more information about hiking on Best Day Hikes. Camels Hump is the prominent peak you see when you drive towards Lumby. Unfortunately, it is one of North Okanagan Hikes with an extremely rough access road. From the top of both humps, you are rewarded with an excellent view over the Okanagan Valley. I used to live at the base of Camels Hump with an access trail for hiking, horses, and ATVs leading to the top of the mountain. The official route via Clier Lake road is more difficult. Travelling east from Lumby on Highway 6, Creighton Valley is the first road on your right. Follow the road for about 16.5 km where you find Bonneau Forest Service Road to the right. Take Clier Lake Road, the small gravel road to the left. Travel past the lake on your left and continue along the hillside climbing above the lake until you reach the parking lot (or until you can’t drive any further). This road is often in bad condition and a 4 wheel drive vehicle with good clearance is recommended. From the parking lot follow the signs to the trailhead. The trail takes you to the first hump, then down to a valley and up the second hump. Spend some time exploring the mountain before heading back the way you came. 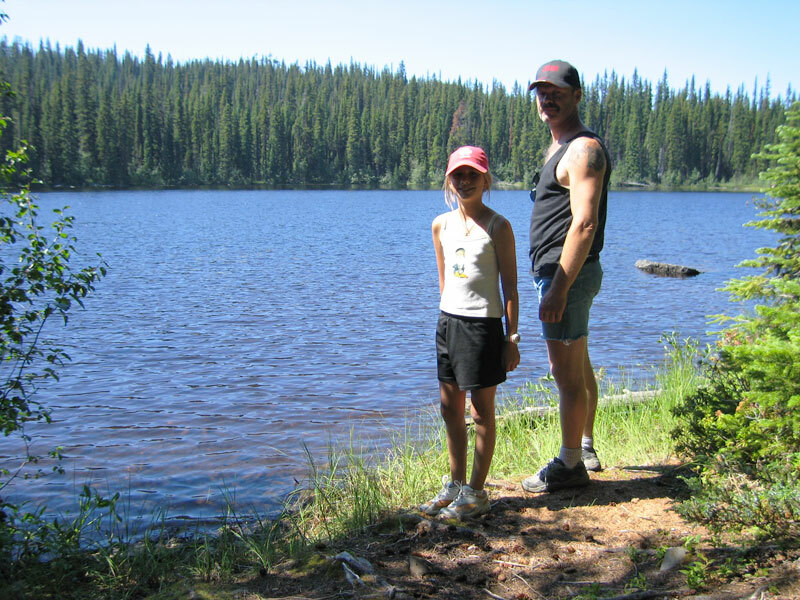 Explore the trail to Denison Lake, a small fishing lake within Denison-Bonneay Provincial Park. This is one of the first hikes I did into the backcountry when I arrived in the Okanagan and it has become repeat at least once a year. The trail takes you through old growth forest on moss covered ground into the Okanagan Highlands with spectacular rock formations along the way. From Lumby, travel east to Creighton Valley Road. Turn right onto Creighton Valley Road and drive 16.5 km to the Bonneau Forest Service Road turn off to the right. Turn onto Bonneau Forest Service Road, drive up this gravel road for 7 km and look for a cut lot road on the right. Park your vehicle there. From there a 2 km walk takes you to the trailhead. At the lake, there is an old picnic site, a good place for a rest and maybe a dip in the lake to cool off. Following the trail along the lakeshore on the right that takes you to a steep drop-off with a magnificent view over the valley. 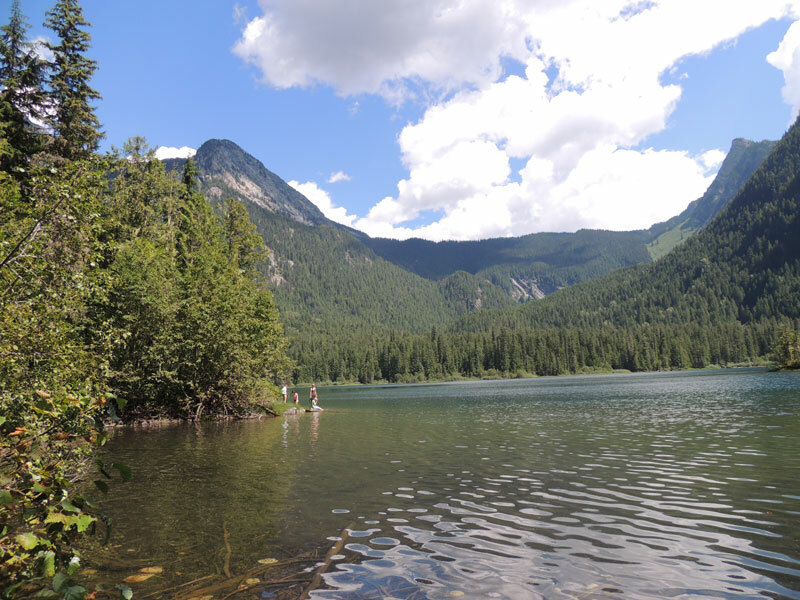 Spectrum lake in Monashee Provincial Park is a popular destination for the Okanagan locals. Long before the park was established in 1962, the name of this wonderful lake was Rainbow Lake, a most suitable name for this picturesque lake, which is abundant with rainbow trout and is a fisherman’s paradise. I find it interesting researching old documents to finding out how geographical name changes took place. Nobody knows for sure, but often it was one the first explorers to the area that named lakes and mountains. According to documents, some names were changed later by Government surveyors that decided to name mountains and lakes after themselves. From Lumby, drive 20 km east on Highway 6 to Cherryville. Turn left onto Sugar Lake Road and drive approximately 48 km to the Monashee Provincial Park turn-off. Another 11 km will take you to the parking lot and the trailhead, park information and an outhouse. The dusty gravel road is suitable for ordinary cars. Cross the footbridge over Spectrum Creek and follow the well-maintained trail to the lake. There are plenty of mountain streams to fill your water bottle on the way. At the lake, you will find a Park Ranger Cabin, tent platforms, several shelters, piped drinking water, food caches, and pit toilets. A paradise in the wild! 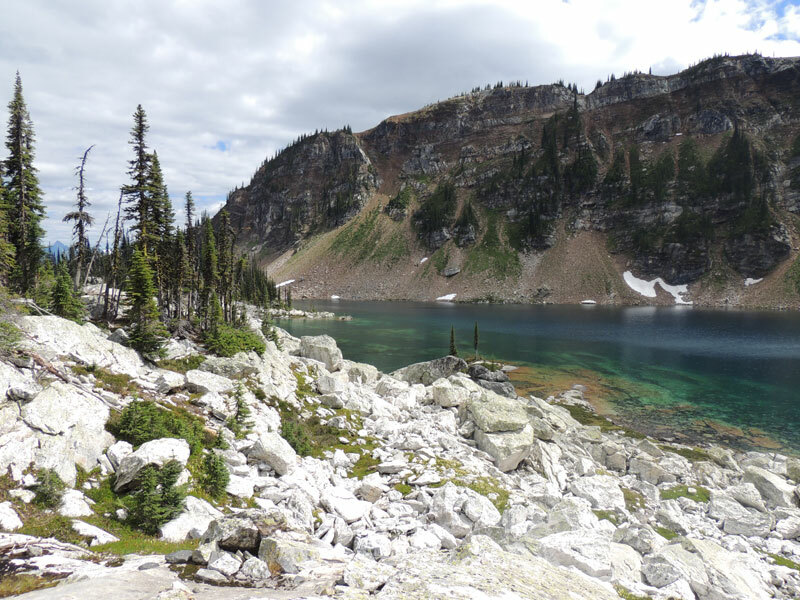 Twin Lake is an ideal destination for hikers and backpackers who want to get a taste of the alpine wilderness. Part of the trail is steep and rocky; just take it slow and it will be a memorable experience. Don’t forget to stop and take a deep breath, take in the fresh mountain air and enjoy the magnificent mountain peaks and the valleys covered with wildflowers. As you approach the jade coloured lakes nestled between mountains you will be glad you came. From the lakes, you can scramble up to a couple of summits for endless Monashee Mountain views. To get to the Twin Lake Trailhead from Lumby, drive 22 km east on Highway 6 and turn left onto North Fork Road. At the end of North Fork Road turn onto Severide Creek Road. Continue on this road until you come to the parking lot, where you find an outhouse and the Twin Lakes hiking trail sign. Note! The last stretch of road can be rough and a 4wd vehicle is recommended but not necessary if you drive with care. The trail to Monashee Lake was one of the toughest ones I hiked in the North Okanagan. An elevation gain of 700 m over 4.5 km makes it slow going unless you’re in perfect shape. This beautiful glacier-fed lake is located in the Pinnacles just south of the Monashee Mountains, on the base of a range of jagged peaks. It is possible to continue north on the Mark Berger Traverse. Monashee Lake access is from South Fork Road. To get to South Fork Road from Lumby, drive east on Highway 6 to Cherryville. You find South Fork Road after the Goldpanner Cafe on the left. Drive 2.5 km and keep right. After 2.7 km keep left until you reach 6.4 km, then keep to the right. After another 6.6 km, at km 13 keep left and then left again at km 15. After another 1.7 km, at km 16.7 drive straight ahead to reach the Monashee Lake trailhead. Follow the cow trails into the woods and watch for the red diamonds and red ribbons marking the trail. Route-finding skills are essential at times when the path seems to disappear. Having a GPS with you on this trail is a good idea. The first time I hiked this trail, I hiked up on the wrong mountain first and it ended up being a long day. Once you arrive at the sparkling lake, have a rest and enjoy the alpine surroundings. If you ‘re fit enough, scramble up on the steep hillside, pick a route and off you go. 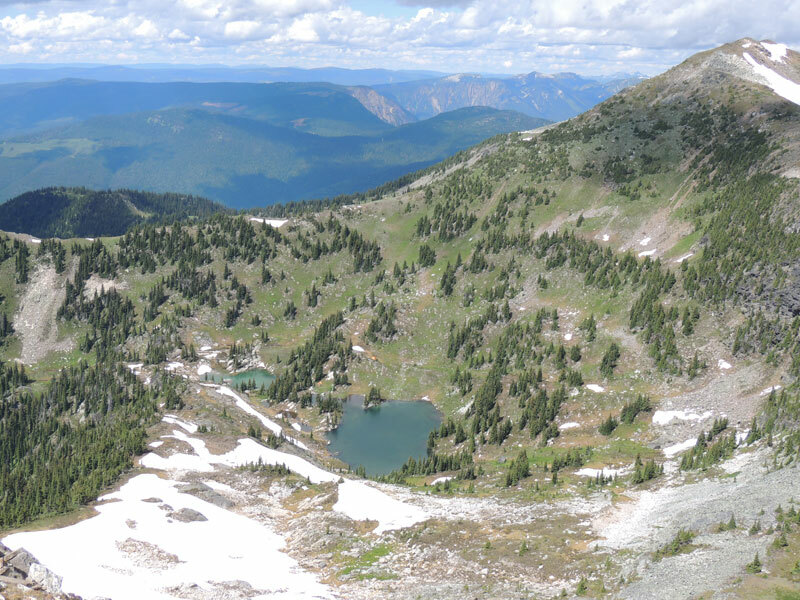 When climbing a peak at Monashee Lake you will be rewarded with panoramic mountain views. Tsuius Mountain is part of the Sawtooth mountain range. This sub-alpine hiking area is difficult and is recommended for experienced hikers only. Different trailheads for Tsuius Mountain are accessible, the most popular one is the one at 49 km from Sugar Lake Road. Drive Highway 6 from Lumby and take the Sugar Lake Road in Cherryville. Continue for approximately 49 km. Turn left just past the turnoff for Monashee Provincial Park, and follow the signs to the trailhead. A rough hiking trail leads to Mirror Lake at about 1950 meters above sea level. From Mirror Lake you can scramble to the 2,460 m summit of Tsuius Mountain. Caution: This is Grizzly country! The trail to Vista Pass takes you along a creek up to the alpine peaks. The peaks to the north and south are spectacular with excellent views of the Pinnacles. Access is via the South Fork Road off Highway 6 in Cherryville. The road is marked with the “Pinnacle Hiking Area” sign to your left. The gravel road is in good condition and a 4WD vehicle is not necessary. Drive with care and watch for cows and wildlife. From South Fork Road, it is approximately 21.5 km to the trailhead. Keep right a km 2.5 and left again at km 2.7. Keep right at km 6.4 and keep left at 13. When you reach km 15 keep to the right and cross Monashee Creek. After another km at km 16, keep to the left. Cross the bridge at km 18.5. At km 19 take the right fork to Vista Pass, (left goes to Pinnacle Lake). At 20.4 km keep left. Drive another km and you will reach a logged clear-cut area where you park. The trailhead is across the clearing to the east with a sign nailed to a tree. The hiking trail is marked by flags. Once you reach alpine meadowland you will have ridges rising on either side of you. For an extensive view of the Pinnacles to the north climb up to one of the ridges and wander along its summit. I recommend the Hiking Trail Book from the Vernon Outdoor Club for any of the North Okanagan Hikes. The book gives detailed information about the trails as well as GPS coordinates. 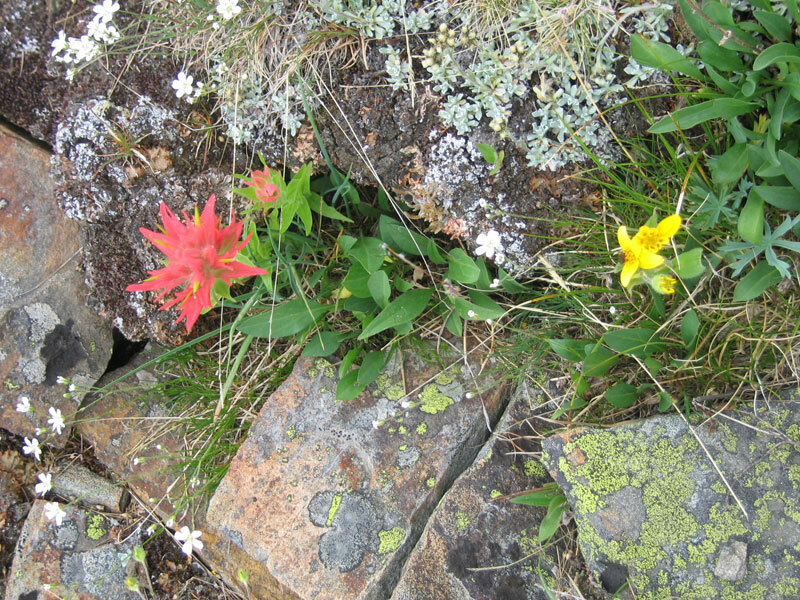 Have you been on any of the North Okanagan Hikes mentioned in this blog? What was your experience? Please leave a comment below! Yrene this is an incredible description/summary of the hikes available in this area. I am so thrilled to get more into backpack camping and feel much more confident doing so with your list as guidance! Thank you, I’m glad my hiking article inspires you. 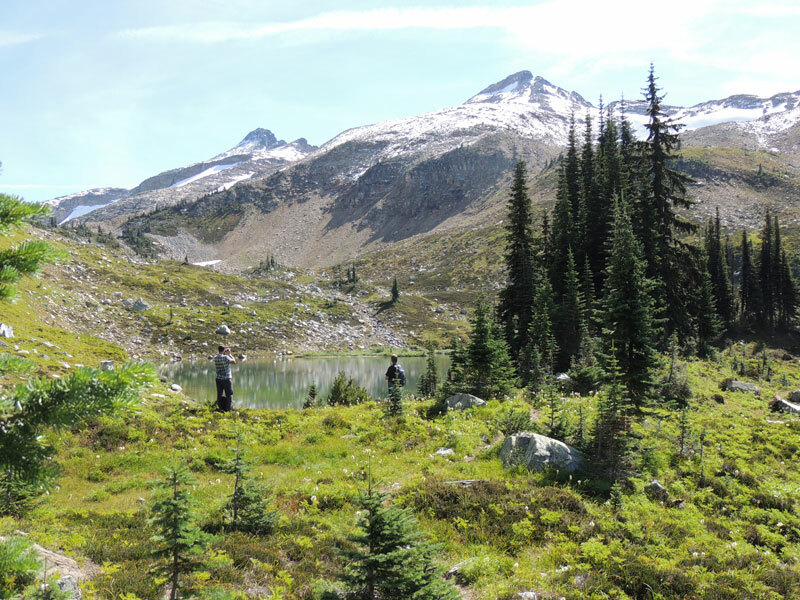 Make sure to get hold of the Vernon Outdoors Club Hiking Trail book for detailed directions if you’re heading into the Monashee Mountains. Trailheads are not always easy to find. Yrene, I am interested in either going up to Pinnacle lake or to Twin Lakes/Boulder mountain in early August2018. Do you have any information about road condition, vehicle requirements, etc? Thank you! Dave, I always travel with an AWD but I have seen normal cars at Twin Lake Parking lot. The access road is gravel and lots of rocks on the road near the end. A car with high clearance is recommended. Join Backcountry Canada Work and Travel Facebook Group and ask the question. Lots of locals in the group and someone there will have details about the present trail conditions. Or contact Vernon hiking club. Also, find out about wildfires, it’s pretty scary in the Okanagan at the moment. I prefer to hike there in September when it cools down a bit. Good luck!